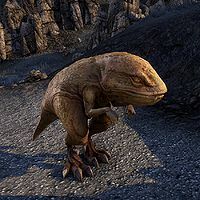 Guar are the primary domesticated herd animal of Morrowind. Some varieties of guar can also be used as mounts or kept as pets. They are initially passive, but will attack if provoked. A charged melee attack that does moderate physical damage. This attack can be blocked to set the guar off balance. Endless-Belly, a guar found in Gray Mire. Tato, a guar found sleeping at a camp underneath a large boulder west of Missir-Dadalit Egg Mine. This page was last modified on 21 April 2019, at 23:00.